The Board of Trustees has identified two missions served in our community by our library. The Primary mission is to serve the needs of our community as a "popular materials" library. To this end the library will feature high demand, high interest materials in a variety of formats for persons of all ages. Emphasis will be on literary service for children, for parents and children together, and large print materials. The Secondary mission of our library is as a repository of and research center for local history. The library will continue to preserve archival materials of local history interest and to make them available for research purposes. Trustees: Carol Clum, Barbara Lilley, Nona Slaughter, Heidi Yerkes, Jody Hughes, Paula Gilbert. You may email the board of trustees at board@gflny.org. Please use the board email to contact the board for library business only. Solicitation will not be answered if sent to the board email address. 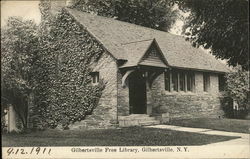 The first Free Library Association to be formed in the county, the Gilbertsville Free Library stands as a symbol of architectural pride and beauty to both past and present day village residents.